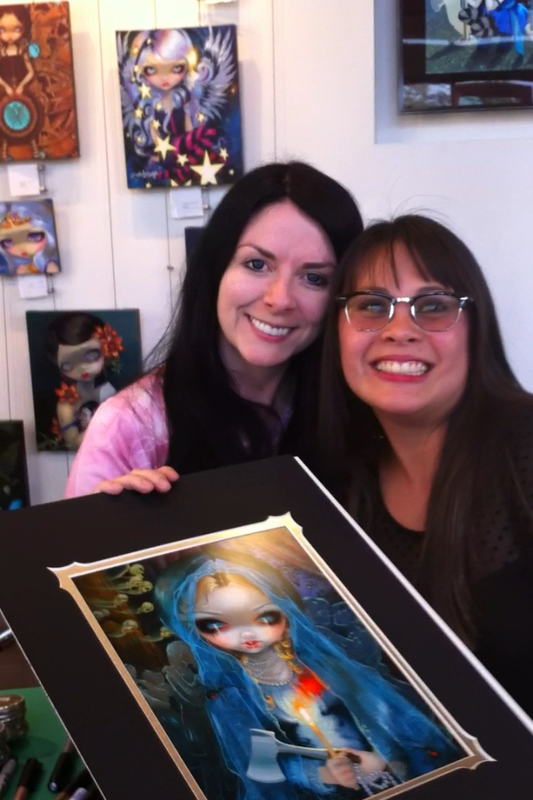 Meeting Jasmine Becket-Griffith at Wonderground Gallery! I got to check off one exciting thing from my bucket list this past Saturday. One of my favorite living artists, Jasmine Becket-Griffith was not only showing her work at the Wonderground Gallery at Downtown Disney, but she completely TOOK OVER the entire gallery! She was there in person, and I finally got to meet her! She was also doing live painting, which I unfortunately wasn’t able to stay and watch, but I did get to see one of her paintings as it was in progress, and got to see how she works and what her underpainting looks like. This was such an amazing experience. She was so nice and down to earth. She had a line outside with other fans waiting to meet her, but we did get to talk a little bit about art and her process. I would have loved to have stayed there longer and just “talked shop” with her! Do I look super excited in this picture? Well I was! Check out more pictures I took at the gallery HERE. You can’t really hear much, but this truly was a significant moment for me and my art journey. I walked away so inspired, so be ready for some new art from me very soon!